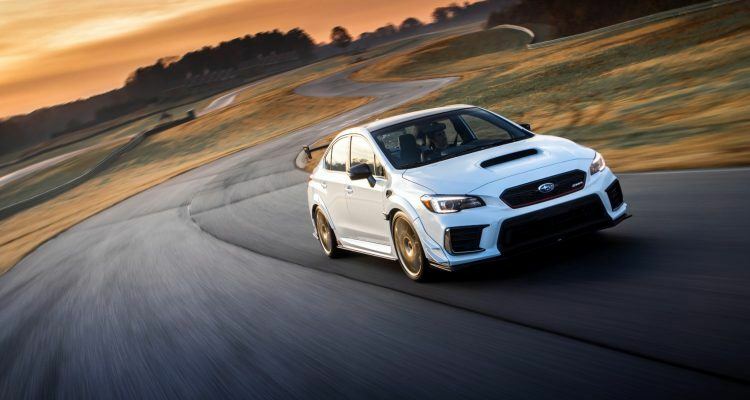 The Subaru STI S209 debuts at the North American International Auto Show. 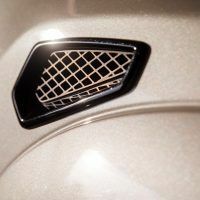 Flexible strut tower bar, Brembo brakes, and a powerful engine are among the highlights. 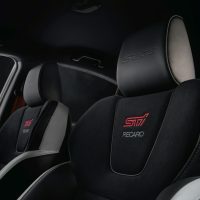 First STI-crafted S-line performance vehicle set for the United States, although numbers are limited. Oh baby! 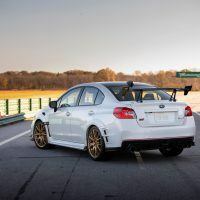 Here’s a tasty piece of automotive engineering: The Subaru WRX STi S209. Wait, scratch that. 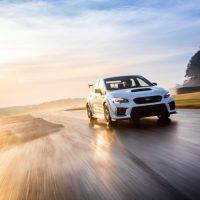 It is simply called the STi S209, or the 2019 Subaru Limited-Edition STI S209 if you want to be technical about it. 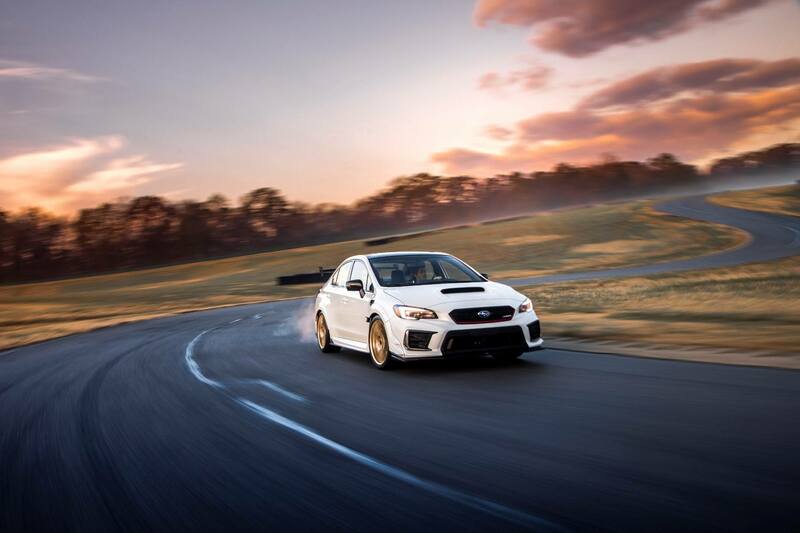 But essentially it’s a big, fast WRX that will force your eyeballs back into your skull like a punch from Jackie Chan. 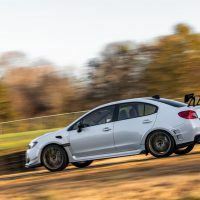 And, given the inherent goodness of the Subie’s always-on all-wheel-drive system, you can use the S209 all the time in any weather. 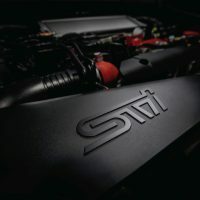 One could say – and I’m one that would – that the main gift Fuji Heavy Industries bestows upon the STI S209 is in the engine bay. 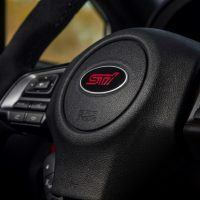 That being 341 horsepower. That is a lot, by any measurement and, in a car this (relatively) small and light, that is a lot (a lot!) of power. 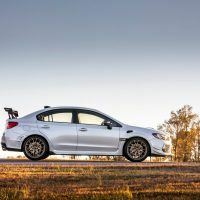 Sure, the STI S209 has more going for it, but that number will be the only argument any number of potential buyers will need to hear. 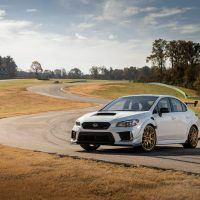 Potential buyers like any number of friends of mine in rally clubs spread across the USA. 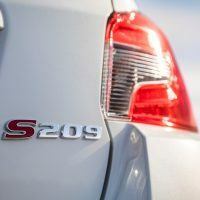 So, besides the engine, what does the STI S209 have to offer? There are upgrades across the board. 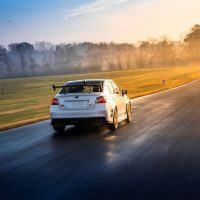 Upgrades in handling, aerodynamics, and driver engagement. 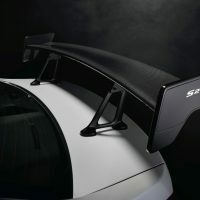 The rally car also sports front, rear and side under spoilers, front bumper canards, and a carbon-fiber roof panel and rear wing. 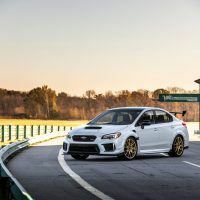 2019 Subaru Limited-Edition STI S209 in Crystal White Pearl. 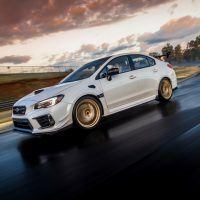 Photo: Subaru of America, Inc.
For starters, the STI S209 now stands 1.7 inches wider than a standard WRX STI, clocking in at 72.4 inches overall. 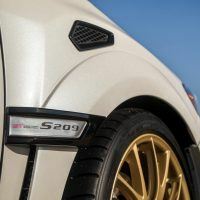 Like the WRX STI Nürburgring Challenge racecar that inspired it, the STI S209 has “expanded wide-body” exterior treatments. Fender flares for you old school types out there. 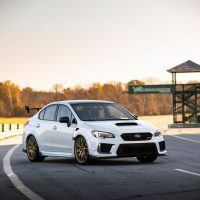 Those flares are there to contain a wider front and rear track, the 19 x 9-inch forged BBS alloy wheels, and those big whopping 265/35 Dunlop SP Sport Maxx GT600A summer-only tires. And please note those are summer-only. So you gravel racers will have to get your own shoes for rally purposes. 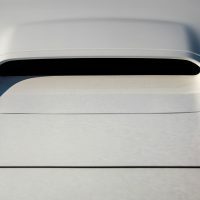 The big vents on the front fenders are there for additional engine cooling, while vents on the rear fenders correct air turbulence and reduce drag. Wanna stop? Course you do. 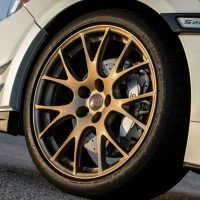 Mash that center pedal and the Brembo brakes, with cross-drilled steel rotors and six-piston monoblock front calipers and two-piston monoblock rear calipers, will haul you down like the Incredible Hulk grabbed you by the trunk. The upgraded high-friction pads bring improved fade-resistance to the party. 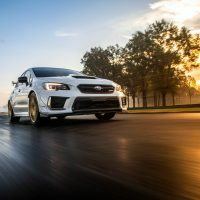 Specially-developed Bilstein shocks, stiffened coil springs, a 20mm rear stabilizer bar, and pillow-type bushings for the front and rear lateral links keep every corner under control. 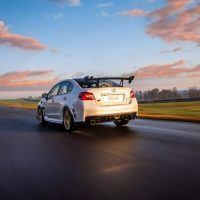 The chassis of the STI S209 is stiffer thanks to the front crossmember and rear subframes, although the front-strut tower bar and the front/rear draw stiffeners are flexible. Bear with me for a sec. A flexible bar, unlike the usual rigid bar, is split and joined with a pillow ball joint in the center. This makes it longitudinally mobile while helping to laterally stiffen things up. Bottom line: optimal tire grip during lateral moments and a compliant ride during longitudinal moments. The draw stiffeners are there to apply tension between the body and crossmember for optimized chassis flex, upping stability while cornering. 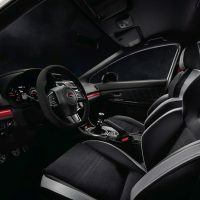 And all the while providing better ride, handling, and steering response. Slick! Now, about all that power . . . 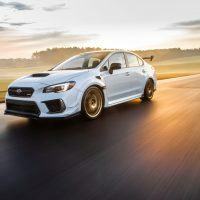 The Dunlop tires are a significant contributor to the maximum lateral grip of over 1.0 g. Photo: Subaru of America, Inc.
Subie reworked the snot out of the EJ25 2.5-liter turbocharged boxer plant! 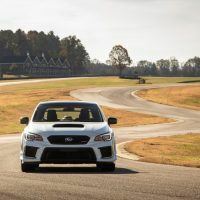 For example, midrange torque gets a 10 percent bump at 3,600 rpm, so corner exits are higher. 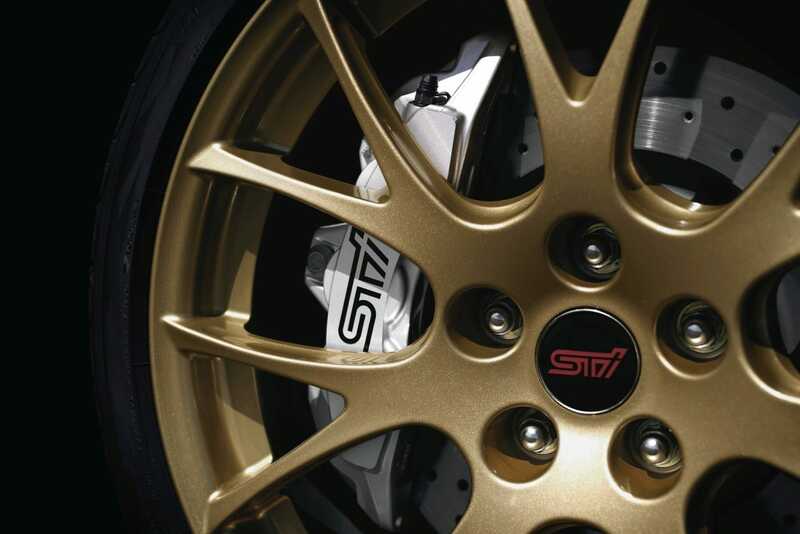 The STI turbocharger, manufactured by HKS, features a larger turbine and compressor for 18.0 psi of boost. The pistons are forged and the con rods are lighter and stronger. 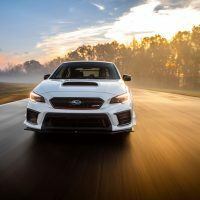 Other improvements include a new high-flow fuel pump, silicone turbo inlet duct, larger fuel injectors, an intercooler water spray system, and an STI-tuned engine control module. There’s a serial number plate proudly displayed on the engine block. 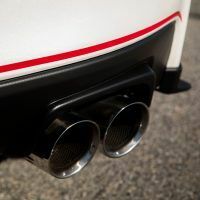 If that’s not enough, the mufflers deliver 17 percent less airflow resistance. 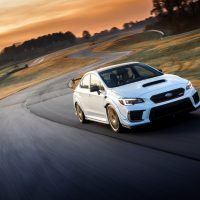 The engine is paired with a close-ratio, six-speed manual transmission and Subaru’s famous Symmetrical All-Wheel Drive system. Duh. 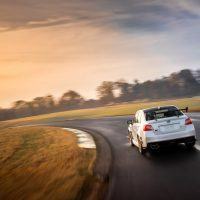 Front/rear limited-slip differentials, natch. 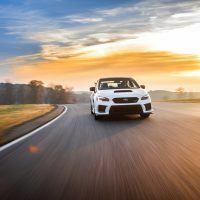 The Driver Controlled Center Differential, Active Torque Vectoring, and the Multi-Mode Vehicle Dynamics Control system are also along for the ride. 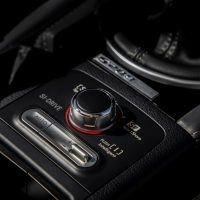 The recalibrated SI-Drive system offers three modes: Intelligent (I) for better fuel economy and smoother power control; Sport (S) for balance between response and control; and Sport Sharp (S#) for the best acceleration times. 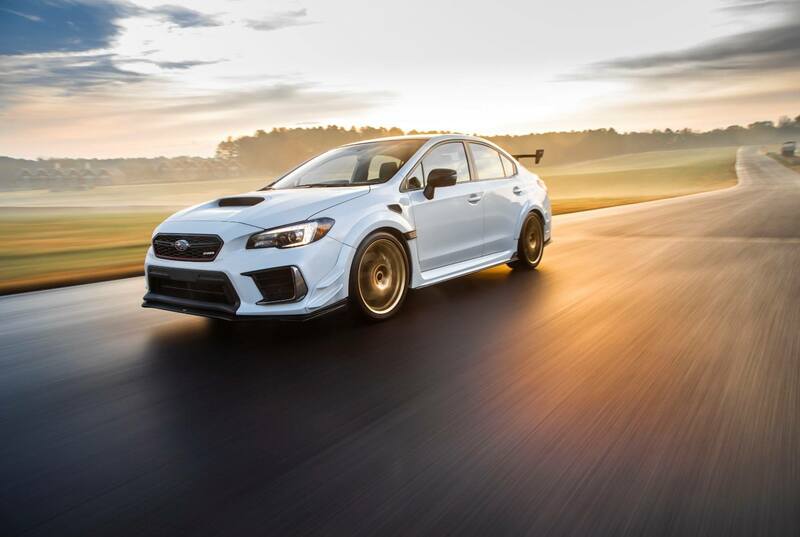 The only real bad news (since Subie didn’t mention price) is that only 200 will be built. And after I get mine, there will be only 199 of them left for you, dear reader. So get in line now! Your color choices will be WR Blue Pearl with gray wheels and Crystal White Pearl with gold wheels. 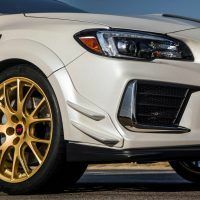 Photos & Source: Subaru of America, Inc., Subaru Tecnica International, Inc.
No Comments on "2019 Subaru STI S209: Small, Powerful & Rare"